A couple of months ago, my parents moved from their house outside of Atlanta -- where they'd lived since 1987 -- to their house in the North Carolina mountains. While going through all of the things they'd saved over the years, they set aside several boxes of things for me and my sister, and one of my items ended up in one of her boxes. In her words -- when she posted this on Facebook over the weekend -- my dad "came up with some jewels, like my sister's 1983 Christmas List. 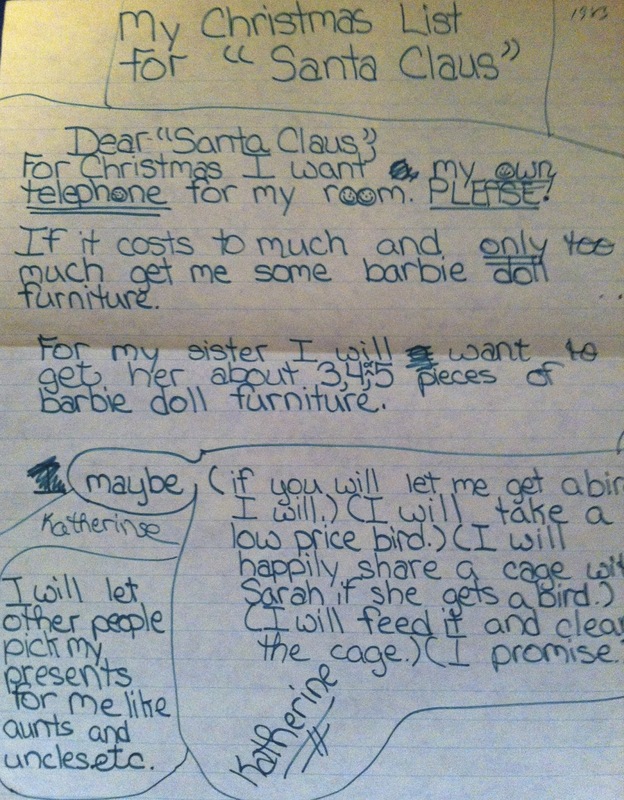 In lieu of a phone or Barbie, Katherine said she would accept a 'low price bird.' "
1. I was 10 years old. And I was clearly in the middle of some sort of crisis about how I would form my lowercase A. 2. I'd known about "Santa" for a long time at that point, hence the quotation marks. 3. I really wanted a phone for my room, and if they weren't going to get me a phone, I wanted it to be because it "cost too much," by golly, NOT just because they didn't want me to have one. 4. I went ahead and told "Santa" what I wanted to get for my sister so they could go ahead and get that. Please notice that what I wanted to give her was what I wanted FOR MYSELF if I didn't get the phone. 5. I deigned to allow "other people ... like my aunts and uncles" to pick out presents for me without my assistance. 6. I was willing to take a bargain-basement bird if they'd just let me have a bird. A BIRD? I have no memory of EVER wanting a bird. 7. I added that nifty little hashmark under my name. I think I did that -- or some version of it -- for about four solid years. P a n a c h e , Internet. And I wondered where my kids got their sense of entitlement. Mystery solved.